California's Central Valley runs from Red Bluff to Bakersfield. The Central Valley is No. 2 on the 25 most important and threatened waterfowl habitats on the continent. 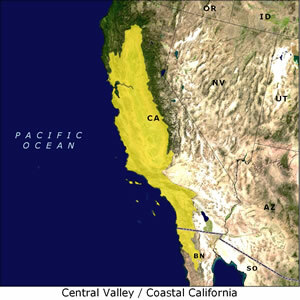 The Coastal California region extends from Bodega Bay south to northern Mexico and includes the important San Francisco and San Diego bays. This region also includes the Salton Sea. Water is a crucial factor in the amount and quality of waterfowl habitat. There is even greater uncertainty over the reliability of water supplies to the Central Valley's privately managed wetlands. DU and its partners have made considerable headway in the Central Valley since the early 1990s, resulting in substantial increases in waterfowl habitat. About 60,000 acres of wetlands have been restored since DU's Valley/Bay CARE (Conserving Agricultural Resources and the Environment) program began. In addition, more than 56,800 acres of existing wetlands have received long-term protection. Critical habitat for 60 percent of wintering waterfowl in the Pacific Flyway. Central Valley is the most important wintering area in North America for Aleutian geese, Wrangel Island snow geese and northern pintails. San Francisco Bay provides important wintering habitat for scaup, scoters and canvasbacks. Uncertain water availability for managed wetlands and agriculture. Agriculture claims 40 percent of water use, and projected demographic changes predict dramatically increased tensions between agriculture, urban users and conservation interests. Rapid urbanization threatens remaining wetlands, water supplies and waterfowl-friendly agriculture. DU has completed or is working on more than 1,500 projects in the Central Valley and the adjacent San Francisco Bay area. Most of DU's work in the Central Valley focuses on migrating and wintering waterfowl, however an increasing emphasis is being placed on meeting the needs of breeding waterfowl. Restoration and enhancement of managed wetlands in the Central Valley and Suisun Marsh. Building fish-safe water diversions to support managed wetlands and rice farms. Protecting rice fields in high growth areas.